Although originally developed for its resistance to sulphuric acid it also has a very high resistance to a wide range of environments. A PRE of 35 indicates that the material has good resistance to warm sea water and other high chloride environments. High nickel content results in a much better resistance to stress corrosion cracking than the standard austenitic grades. Copper adds resistance to sulphuric and other reducing acids, particularly in the very aggressive “mid concentration” range. In most environments 904L has a corrosion performance intermediate between the standard austenitic grade 316L and the very highly alloyed 6% molybdenum and similar “super austenitic” grades. In aggressive nitric acid 904L has less resistance than molybdenum-free grades such as 904LL and 310L. Good resistance to oxidation, but like other highly alloyed grades suffers from structural instability (precipitation of brittle phases such as sigma) at elevated temperatures. 904L should not be used above about 400Â°C. Solution Treatment (Annealing) – heat to 1090-1175Â°C and cool rapidly. This grade cannot be hardened by thermal treatment. 904L Stainless Steel Pipe and Tube Packing904L Stainless Steel Seamless Pipes and Tubes is sleeved into plastic bag individually, pieces wrapped with water-proof material, bundled with nylon rope. Clear labels are tagged on the outside of the package for easy identification of the quantity and product I.D. Great care is taken during operation and transportation. SS 904L ASTM A312 Seamless Pipe packing will be according to international standard in bundles strapped by strips then into containers to avoid any damage. – End of SS 904L ASTM A312 Seamless Pipe protected by plastic caps. We export 904L Stainless Steel Seamless Pipe and Seamless Tube to Iran, Iraq, Oman, Qatar, Albania, Muscat, Bahrain, Turkey, Egypt, Maldives, Italy, UAE, Bahrain, Indonesia, Australia, Kuwait, Saudi Arabia, South Africa, Germany, UK, Denmark, Canada, USA, Peru, Brazil, Nizeria, Mexico, Venezuela (Latin America), South America, Russia, kazakhstan etc. 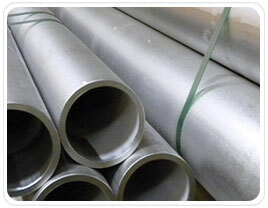 Steber Steel is a well known worldwide exporter of 904L Stainless Steel Seamless Pipes and Tubes, Steber Steel is committed to provide each and every customer with the highest standard of customer service. We deals in 904L Stainless Steel Seamless Pipes and Tubes in India & Overseas, offering a wide range of 904L Stainless Steel Seamless Pipes and Tubes.